Years ago, as a child and young teen, I would occasionally read books in which the colour chartreuse was mentioned, almost always disparagingly. In the pre-internet age it was not something one could just Google, and it never occurred to me to look it up in the Encyclopaedia Britannica or any of the large dictionaries we had at home. As a result, for years I equated ‘chartreuse’ simply with “ugly colour.” In my mind it inhabited a hidden section on the colour wheel somewhere near “puce,” whose particular hue was similarly a mystery (it turns out that “puce” comes from French, to which it translates literally as “flea;” hence the unpleasant squashed-red-brown it denotes. Chartreuse, I have learned, is a liqueur produced by French monks of the Carthusian Order since 1737. The liqueur–reportedly distilled from 130 herbs steeped in alcohol–takes its name from the Chartreuse mountains in the Grenoble region of southeast France. The mountains are beautiful and verdant, and seem to glow in the very green-and-yellow shades that give both Chartreuse liqueur (which comes in both green and yellow) and the colour its name. And somehow, in the manner of all things, the colour chartreuse eventually made its way to America as an affectation, first as a jellied dish made with Chartreuse liqueur (somewhat infamously, it was reportedly served as a First Class dessert on the Titanic) and later, as a staple of the Hollywood Regency style of interior design popularized by Dorothy Draper. By the seventies, chartreuse–still in wide use in both fashion and interior design–had become a kind of caricature of itself. In 1972 Crayola introduced a chartreuse crayon as part of its fluorescent series, enabling children to combine incompatible colours as well as any grown-up hippie might–but even then more muted shades of green (most notoriously avocado) and contrasting primary colours had begun to dominate the design world. By the eighties chartreuse was distinctly dated, and in 1990 Crayola quietly withdrew the chartreuse crayon (the new name was ‘laser lemon’). Recollections of my late seventies-to-mid-eighties childhood are, of course, redolent with memories of avocado, and from time to time at a thrift store I still come across (and bring home) the odd brightly-hued polyester dress in chartreuse and, say, deep purple. Not that I think of it as chartreuse, a colour whose overuse followed by denigration and cultural erasure has been so complete that the word has never been a natural part of my vocabulary. This morning I dug through my daughter’s box of crayons, looking for chartreuse. I found it in a crayon labeled “green-yellow.” This is actually an utterly accurate description of chartreuse, which exists precisely at the midpoint of green and yellow. 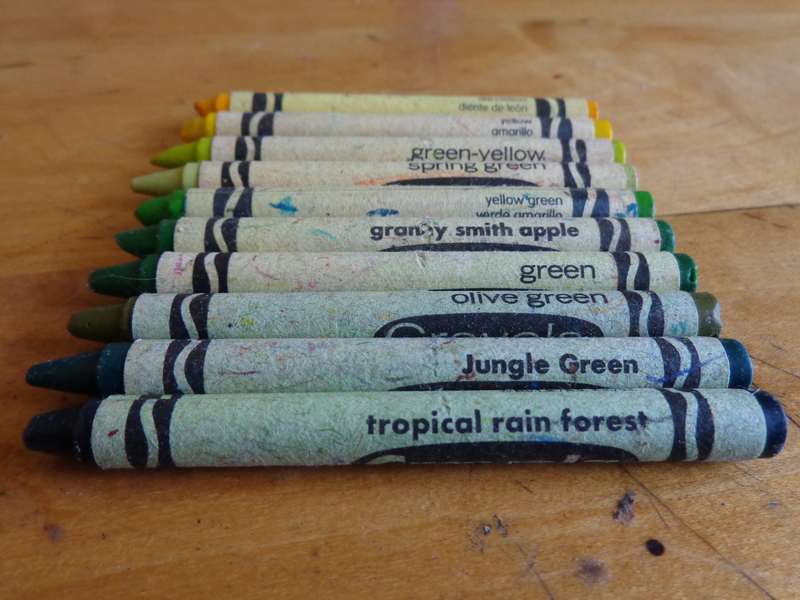 While picking through my daughter’s crayons, I began thinking about the names Crayola chooses for its colours, and started to see them as cultural artifacts. Current colours, such as “fuzzy wuzzy brown” and “macaroni and cheese” seem to suit the current generation of children raised on daycare and cartoons about as well as “chartreuse” and “maize” might have fit kids growing up in the seventies. There is apparently a move afoot to abandon colour names. While I (and presumably IKEA) can see the obvious utility to such a thing, I think abandoning colour names entirely would be a terrible shame. Crayon (and paint and design) colours are meaningful cultural artifacts. They are records of our shifting preoccupations, and proclivities, and aspirations. 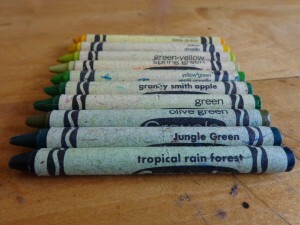 I wonder, a little, how future crayons will be named. I can easily imagine Chador or Raven, or Masala (in place of burnt sienna), or Polar for the pale blue shade of Arctic ocean meltwater currently called light blue. I wonder, too, if some of the old colours might make a return. Chartreuse, for example, has made a hipster-ironic reappearance in the design world. The liqueur for which the colour is named has also come to the attention of Brooklynites tired of Absinthe and, reportedly, Jagermeister. Soon enough, Chartreuse jelly will undoubtedly appear on the menus at Waldorf Schools all across the land, and at some point Crayola will have no choice but to dredge up Chartreuse from the archives. Perhaps at the same time it will make a little bit of room for puce.